Topps announced their giveaways and redemptions for the National in Chicago earlier and we covered it in one of our “Everything You Need To Know About...” posts. But it turns out they were holding out on us... just a little. But their is nothing little about this card that is now being offered as a redemption at the Topps booth. Collectors who rip open a box of WBC Tribute can get this exclusive Yasiel Puig Gypsy Queen card. 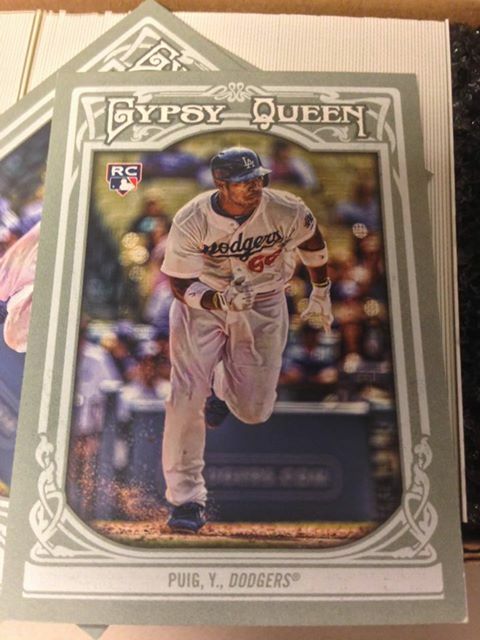 So open a box of really cool cards, (use this link to see our box break recap and review of Topps WBC Tribute) and walk away with a NSCC exclusive of one of the fastest rising stars in the MLB right now. But get there early as this redemption is limited to 1 per day per collector and 100 per day in total.